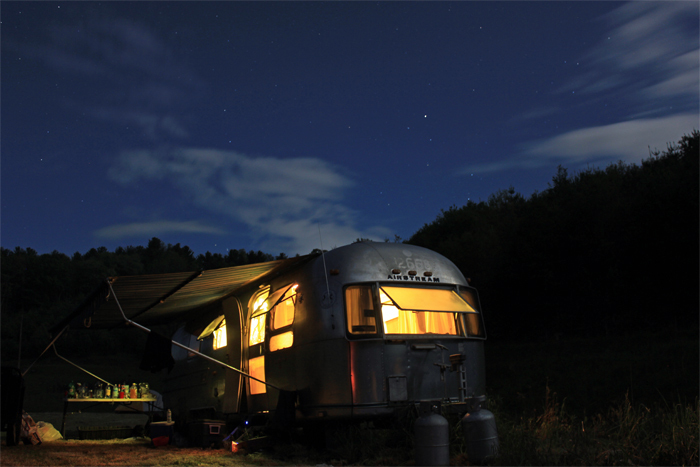 At Booker Hollow there lives an Airstream. After what seems like a long time away, I'm back to the blog. Now that I've found a permanent home for my freelance writing portfolio, I'm changing the course of Greetings from Teakettle Junction to be more what I intended it to be: an exploration of the world around me from places to flavors to the people I meet and the sounds that I hear. The supermoon. And a painter. I was camping with friends at Booker Hollow near Grassy Creek, North Carolina, and I knew it was time to write again, and not just for clients or for publications, but for me. See, Booker Hollow reminds me of my home state of West Virginia and there was something comforting about returning to the arms of the mountains (even if they weren't my mountains), to being engulfed in the hollows and coves and evening fog along the valley floor. Much like my formative years in West Virginia, I found myself with only one other artist, a painter, in Booker Hollow. I spent the evening with him perched on a rock looking back into the cove at a homestead from the 1800s still standing, rusted roof, busted windows, tree growing through the wall and all. Watching him paint and listening to him talk about why he put his brush where and how he dissected the landscape made me more than a little jealous. Here was a man who, like me, worked 50+ hours a week. As an architect, his work was like mine - fueled by creativity. He knew how draining it can be to try to switch off from work mode and create something for yourself. Yet here he was. Among his camping gear was a tripod and painting kit. He came prepared to find inspiration in the landscape, but so did I (or at least that's what I told myself). The most notable difference was that he came prepared to do something about it. There, on that rock, overlooking the stream and the cattle and the rusted-roofed homestead, I decided it was time to take the pen back for myself and create something personal. So I've returned to this blog. And here I am, prepared now to do something about it.